My family and I took a short break to visit my son who works there a few days ago. It was lovely to see this busy city rain-washed and yet bustling. 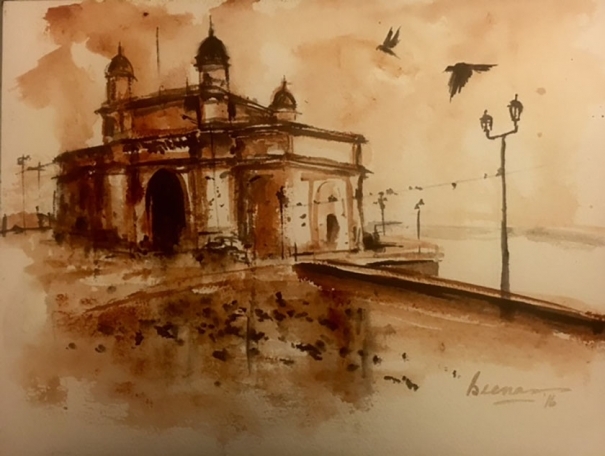 On seeing the Gate Way of India and the entire shoreline it reminded me of a washed canvas and hence I took to watercolor my image of Mumbai. It is also a nostalgic trip down memory lane for me to when I started painting using the medium of watercolor - in tones of sepia. I had my first solo exhibition of watercolors at a reputed bank in the year 2001.